by Niall Douglas. Last updated 2004-09-28 00:00:00 +0000 UTC . This page has been accessed 5,944 times since the 8th August 2005. Oh look! It's a woman! Tuesday 21st September 2004: 11.40am. Today is my fourth day in St. Andrews and second actually spending time in halls as I was spending time with my father until Sunday night. I took him down that wonderful mine and counter-mine created when the castle was under siege sometime in the 16th century, plus we went to visit our ancestral home Grangemuir which lies just north of Pittenweem which is on the opposite side of Fife from St. Andrews (though it isn't very far away). Grangemuir is now a caravan park and Grangemuir House itself lies in a state of ruin after having been most recently an old age person's home. It's quite a boxy house though the cement they packed over the marble exterior (probably to keep the damp out) certainly doesn't help the aesthetics. Shame. The recent extra spate of exercise has left my right foot with a swollen muscle which has been making walking difficult so I've used this as an opportunity to read the introductory texts to Economics as so I can bring up my general knowledge about it to a similar level of that in Philosophy. I have my father's old economics books, so I started with Lipsey's An Introduction to Positive Economics which is probably still mostly good. Most unfortunately, it would seem that the axioms of Economics are not just substantially broken but dangerously broken - any system of mathematics based upon such lousy axioms would be pointless. I do agree with Lipsey that if his book is still an accurate reflection of modern economic thought then the "science" of economics is immature and needs a substantial dose of modern mathematical techniques with a new more correct set of axioms. While I'd expect this to be so, I don't believe that Economics has advanced in forty years quite as fast as computer programming where even the techniques in common use today are known to be substantially inferior to the state of the art. I guess it'll depend on how accustomed & accepting Economics is of change, which I find ironic since Economics is totally about change! 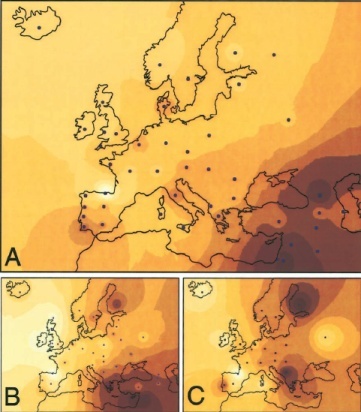 I'll leave you with a little map of similarity of genetics within Europe which I got from The Longue Dure´e of Genetic Ancestry: Multiple Genetic Marker Systems and Celtic Origins on the Atlantic Facade of Europe which is some very recent research based upon DNA analysis. A is similarity of mitochondrial DNA, B is similarity of Y chromosomes (maleness DNA) and C is similarity of normal human DNA. As you can see, the Basque's female line has stayed the same (as mitochondria pass from the mother), Ireland/Wales/Scotland share maleness with northern Spain and through the fact that greater similarity means the older and less disturbed a population is, it means that the Irish and Basques are of a similar genetic age - 15,000 years ie; we were the first in Europe as the ice sheets retreated. More importantly, none of us are Celts - they arrived much later and clearly didn't breed significantly with the locals, though the locals obviously adopted their ways of thinking and making pots etc. Interesting eh (almost no one I've showed this to thinks it is)? Anyway, time for lunch - be happy! Friday 24th September 2004: 8.39pm. It has been a very long time indeed since I have written something in this virtual diary which I actually needed to write down - for years now I made a perfunctory entry to keep there being one per month. But tonight, probably in combination with being tired from a day's long programming, I can't concentrate - I am distracted and unable to stop other thoughts from running through my head. Maybe, to return to the original purpose of this diary, by writing them down I can claim a snippet of peace for a while. These thoughts are my subconscious bubbling over into consciousness. I know this to be true because the agitation I feel is typical of my subconscious in turmoil - I can normally exclude this unless I'm tired. And in fact, I've been in turmoil since I suppose Monday. And what has caused this? Yes, it's female - a young lady I have met who is not only very beautiful with a fine body, but also very intelligent and to whom I am strongly attracted. But that's the point - I am too attracted to her, and the attraction is of the form which has led me down many a road of disaster including the most recent relationship. And I promised myself then that no matter what, I would not repeat that mistake. Now I know the sense of this. There is no question that a relationship between me and her would be another disaster, it would bring out the worst in me and furthermore she has a repressed love-hate thing going with the whole concept of men probably due to the usual causes, so cue the whole thing with my mother which any sane man would avoid instantly. However knowing what must be done is not the same as knowing how to achieve it, and it is achieving it which is the major problem which is causing the turmoil. Normally the solution would be to avoid contact with her and problem solved. This has always worked in the past, but for various reasons it is not available this time round. Another solution is to press buttons in her to make her fear me and avoid me but this is unethical, wrong and also strategically a bad idea (I have done this before and seen the negative consequences for both sides, and with maturity I know I cannot do this ever again - but even with my improved self-control I have still lost it momentarily and said things I should not have done, luckily I have stopped myself immediately afterwards so far). So a third way must be followed, a new way, a road never yet followed. Which means, possibly, facing up to a whole pile of demons I'd far prefer left repressed deep down somewhere far away. And I found myself scowling when I typed that last sentence. In fact, I just reread the whole piece and I scowled again when I read it! On the positive side, of which I am desperately trying to convince myself, this is finally a long-term available opportunity to work through a lot of my psychological baggage and come out a better person as a result, most probably someone finally capable of sustaining a long term relationship. On the negative side, all that repressed crap is really stuff I don't like to think about - an analogy is knowing that a fire will burn you, but if you don't smother it with your hand it will continue to burn. Just before you stick your hand into that fire, you feel a strong sense of inevitability of how unpleasant it's about to be - well, that's what I feel when I think about that stuff. Time to return to the psychologist as some of you will shortly be suggesting by email? Probably not yet, I'm considerably mentally stronger now than I was last time and in all likelihood within a week I will have subconsciously arrived at a way to proceed, which if undisturbed should carry me through. So I'll give it a while yet. Be happy!